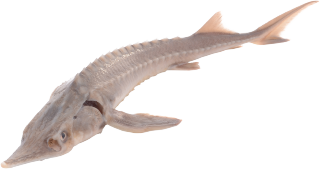 The sturgeon originally comes from the Eastern bloc, including Russia, Romania and Hungary. In the country side a sturgeon may reach as many as six yard with a weight of maximum 400 kilograms. A sturgeon may reach the age of about 50 to 100 years. It is a beautiful fish which has an almost prehistoric appearance. It looks a bit like a shark. A sturgeon belongs to the most primitive among the bony fish. While sturgeons used to be found in all large European rivers, they now have nearly disappeared except for a few small populations. By nature a sturgeon is a strong fish which will not easily fall ill. However, it is a fish which may grow very big in a pond, although this may last rather long. A pond should therefore have a depth of minimum 50 in everywhere and it should contain very few plants. Assume that per sturgeon you have 1,000 litres of water in your pond. Moreover you absolutely need a powerful filter because a sturgeon likes a strong current. On the bottom of your pond a sturgeon likes a layer of mud and absolutely no sharp gravel or sand because it is sensitive to it. If you want to keep sturgeons in your pond, there are a number of items for special attention to bear in mind. An sturgeon needs special feed for sturgeons, because its mouth is at the underside. The feed will sink to the bottom and has a very strong odour, so that it looks like its natural feed. A sturgeon is a bottom inhabitant, which is living in cold streaming and very oxygen rich water. A sturgeon does not have sufficient possibilities to pump water round with its gills and will consequently have to swim, just like a shark, in order to breathe in enough oxygen. This implies that good aeration and room in the pond are therefore indispensable. A sturgeon can not swim backwards. 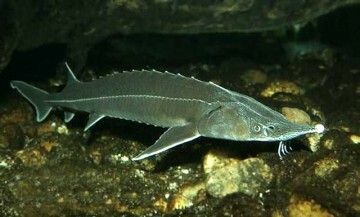 In a pond with plants or filamentous algae a sturgeon will soon be stuck while swimming and it will drown. Especially smaller specimens are not strong enough to swim off and may lose their lives just in a little piece of filamentous algae. Do you want to have a sturgeon and a koi in one pond? You should bear in mind that a koi will often find the sturgeon feed sooner than the sturgeon itself. Especially little sturgeons will die of starvation this way. It will help if you feed fish every day at the same time and place. In this way you train fish to find out where their feed is. If you divert your koi on the opposite side of the pond, the sturgeon will have some more time. Sturgeon feed has a different composition than koi feed. It is far richer and in winter it is not suitable to feed koi on. A better solution is to distribute sturgeons sinking koi feed. The bottom of the pond should stay clean. Accumulating dirt may cause gasification as a result of which sturgeons will fall ill and could die. This is caused by the fact that the bacteria consume all oxygen in the water layer where sturgeons stay most. A proper soil discharge is therefore necessary. Sturgeons up to 8 in have to be fed every 3 hours, otherwise they will die. As a rule of thumb you can apply that a sturgeon needs a pond size of at least 10 times its length. During the coming 7 years they will grow considerably.